Are you looking for the perfect place to escape for a few days of peace and quiet? Get away from it all at our beautiful 1 bedroom cabin better known as the "The Island Cabin". Which is just perfect for couples, it features a wrap-around porch surrounded by water and beautiful views in all directions. It is the perfect place to catch up on a little rest and relaxation! Sit on the porch and enjoy your morning coffee while taking in all the beautiful sights and sounds. Stroll around the woods and down by the creek to enjoy nature at its finest. Drop a line in the lake and enjoy the thrill when you reel in the “catch of the day” from the variety of fish stocked in our lake. (All fishing is catch-and-release.) Or, just float around in our two person fishing boat and unwind. Watch the sun set as you cook your favorite burger on the gas grill on the back porch. At day’s end build a fire in the large stone fire pit, perfect for late night snuggling and roasting marshmallows! The cabin and lake are located out in the country, yet are only minutes from town and Lake Cumberland. Come enjoy the peace and quiet. We guarantee you will leave rested, relaxed, and anxious to return! Bathroom linens, tissue paper, hand soap provided. Linens provided for the bed and bath. Rental includes a two-person boat with trolling motor for use on our lake. Life jackets are included. A large wrap around deck so you may enjoy the tranquility of the lake. There is golf course located with in minutes of the cabin. My honey found this hidden gem and booked it for our 1 year celebration. Little did I know he was gonna propose to me!! Perfect place, setting and time. The cabin was awesome and so are the owners. Everyone has asked me about the cabin. Loved it!! My boyfriend and I had an absolutely amazing time here, and Timmy and Rose were absolutely wonderful. The cabin was very well kept, and Timmy and Rose provided us with everything we needed and more. Rose made us a wonderful cheesecake and there were personal touches all throughout the cabin that really made it feel like home. Timmy frequently stopped by and it was so nice to talk to him and get to know Rose and Timmy. Highly recommend this place, and I cannot wait to come back! Timmy and I are so pleased that you both enjoyed yourselves and that you felt right at home. That means a lot to us. We do look forward to your return. We loved the cabin. The lake was so beautiful. My husband and I really enjoyed every part of our experience on our stay. Everything was well kept and very clean. Rose and Timmy had a card and wonderful chocolate dessert waiting for us, we were celebrating our anniverary. My husband had a good time fishing. I enjoyed the ducks and wonderful scenery. I didnt get to enjoy the porch as much as I would have liked, next time we will go when its a little warmer outside. We both had a relaxing and great stay, already looking forward to our next stay. Thanks for sharing your cabin with us. So very glad you chose the Island Cabin to celebrate your anniversary. The weather was some what windy and cold. March weather is very unpredictable. We are so very glad that you enjoyed your stay. My husband and I had a wonderful and relaxing weekend at this cabin. We had everything that we needed and really enjoyed our stay. We will definitely be back! Timmy and I are so glad that you both enjoyed your weekend. It was a pleasure having you as our guest. Wonderful property! Gracious host! Everything was first class. Tim and Rose are TOPS! We enjoyed this beautiful location. Nice big lake, ducks and geese swimming around. Watching the big catfish feed. Taking a stroll around the property beside the creek. Enjoyed Tim coming by each day and visiting with his stories. Rose keeps those cabins spotless! We will definitely go back! Timmy and I really enjoyed meeting you. We are so glad that you enjoyed your stay. Thank you for choosing to stay at our property. Feel free to come back again. Timmy and Rose are heaven sent. We have never met people so dedicated to serving and showing hospitality to people. From the second we called to reserve the cabin, all the way until we checked out, they checked on us, spoiled us with goodies, had a perfectly clean cabin waiting for us with the fireplace lit and all and were ready to provide us with anything we needed. This cabin was absolutely stunning and pictures do not even do it close to justice. We will be back without a doubt! Thank you all for creating such a perfect getaway and being so dedicated to making it all that it is! Thank you both so much. We are so happy that you enjoyed your stay. You both are pretty special yourselves. I appreciate the pictures you sent us. Timmy and I wishes you a very blessed New Year. Peaceful Valley Lake and Cabins is located in beautiful Russell Springs, Kentucky just minutes from the State Dock in Jamestown. Don't miss a trip to the Wolf Creek National Hatchery or head to nearby town Nancy to visit the historical Mill Springs Civil War Battlefield and pickup a delicious homemade pie from Haney's Apple Orchard. 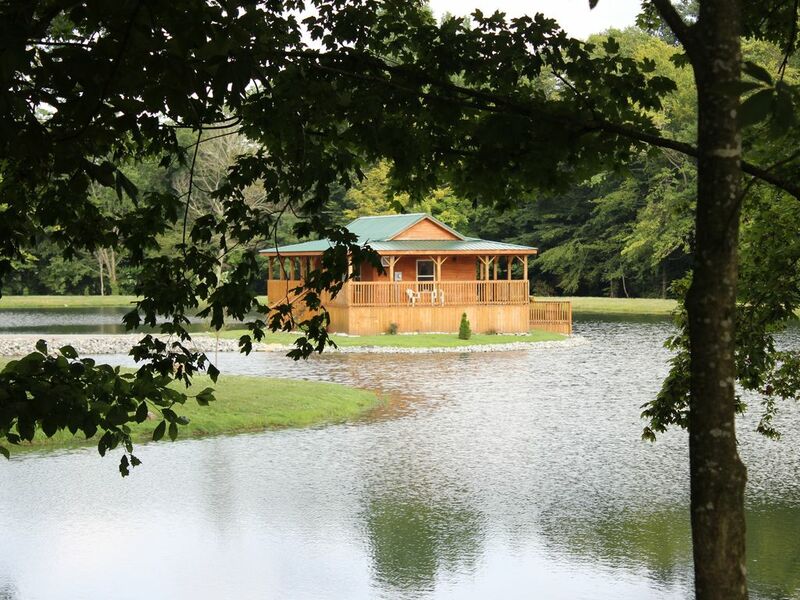 So many things to see and do near us, but we have a feeling you won't want to leave the cabins, which include a private catch-and-release lake for your own fishing and boating!